This book is the transcript of a witness seminar on the history of experimental economics, in which eleven high-profile experimental economists participated, including Nobel Laureates Vernon Smith, Reinhard Selten and Alvin Roth. The witness seminar was constructed along four different topics: skills, community, laboratory, and funding. The transcript is preceded by an introduction explaining the method of the witness seminar and its specific set-up and resuming its results. The participants' contribution and their lively discussion provide a wealth of insights into the emergence of experimental economics as a field of research. This book was awarded the ?Outstanding Research Publication award? for 2012 by the American Educational Research Association?s Division I: ?Education in the Professions?. 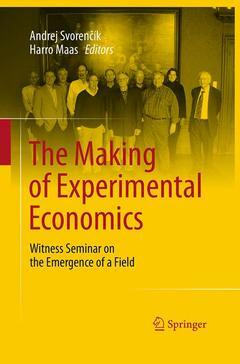 A Witness Seminar on the Emergence of Experimental Economics.- The Very Beginnings.- The Growth of a Community.- Funding.- Knowledge and Skills.- Laboratories.- History and Future.- Episodes from the Early History of Experimentation in Economics.- Biographies of Participants.